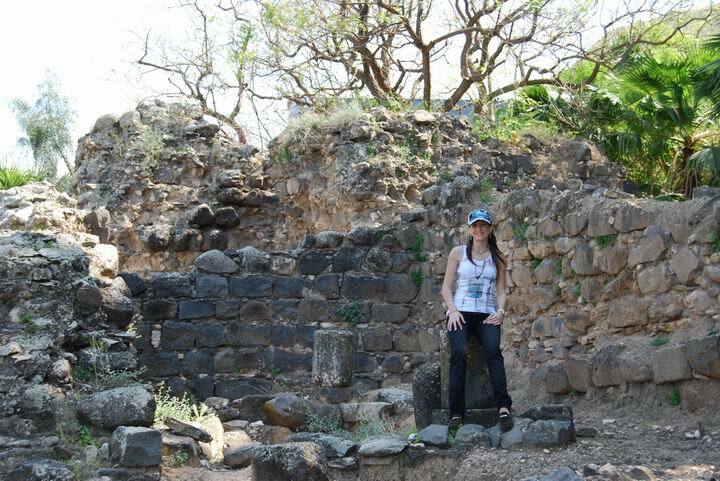 Hammat-Tiberias was a walled Canaanite city mentioned in the Bible. It peaked during the Roman/Byzantine periods, and was famous for its healing powers. A number of synagogues were unearthed and reconstructed, including the 5th C Zodiac mosaic. Joshua 19: 32, 35: The sixth lot came out for the children of Naphtali.... And their border was ... the fortified cities were Ziddim-zer, and Hammath, and Rakkath, and Chinnereth..."
The city was a walled city during the Biblical times, and peaked during the Roman/Byzantine periods. It was known for its warm health springs (a total of 17 springs, at a temperature of about 60 C) and was a spa center for the great Roman city of Tiberias. 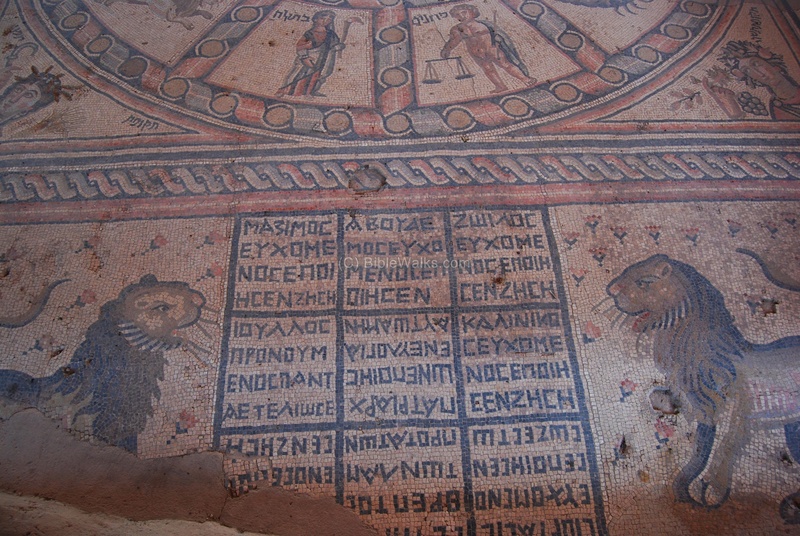 A number of synagogues were unearthed and reconstructed, including one of the most important mosaics - a zodiac with symbols, inscriptions and symbols, and two 7-branched menorahs. The site is a national park and is open to the public during visiting times. It is located on the southern entrance to Tiberias, across the street to the modern baths (Hammei-Tveriah). 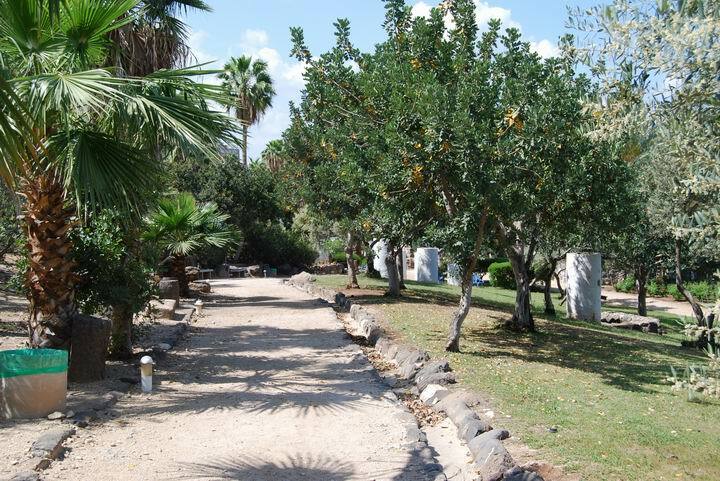 The site was known for its healing waters even before the Israelites conquered the Holy Land. It may have been listed in the Anastasi Papyrus, written at the 13th C BC during the Ramses dynasty, when the author of the document tells about crossing Hammat. 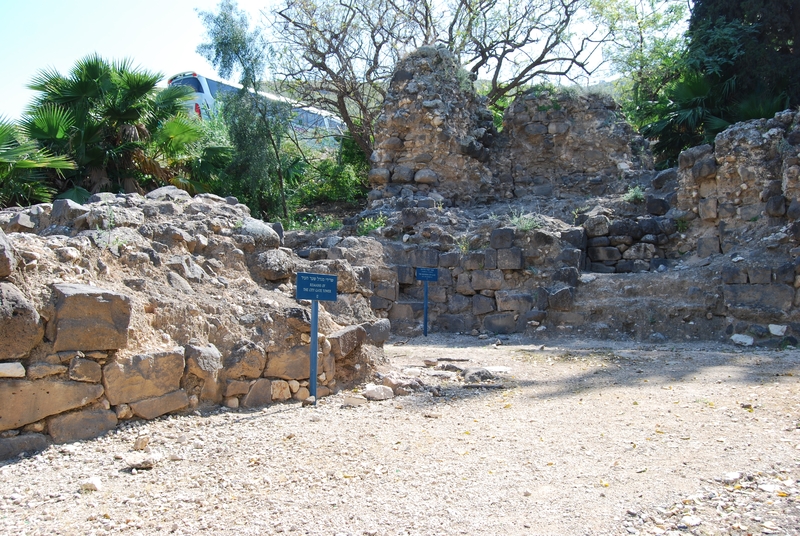 It was one of the cities in the region of Naftali, and according to the Bible (Joshua 19, 32-25) it was a fortified Canaanite city. Its location, on the ancient trade route from Syria/Mesopotamia to Israel/Egypt, surrounded on two sides by the lake and the mountain, made it a prime strategic place. The first structures were established in the Hellenistic period, and the site was known as Emmaus of the Galilee. 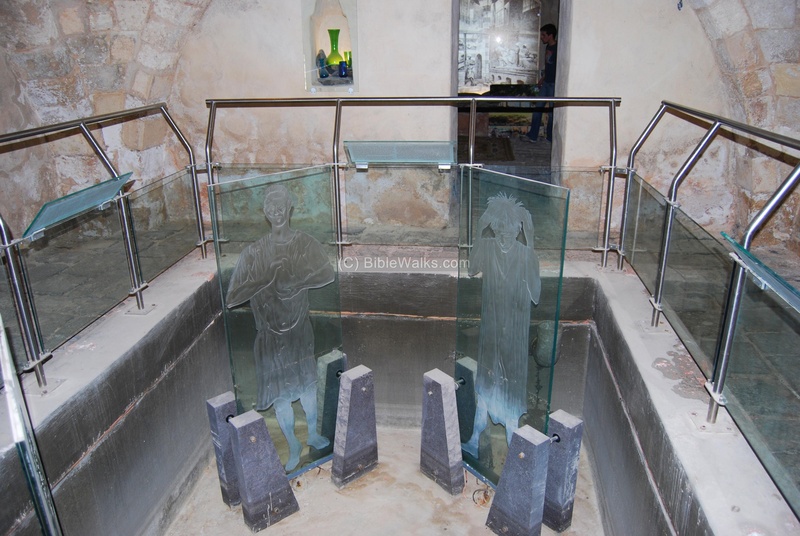 The Romans installed a large set of baths in the site, whose waters were considered healing. At those times the number of sick people was extremely high, most of them without any cure, as implied in the new Testament and the miracles of Jesus. The healing power of the waters made the site popular in the Roman world. 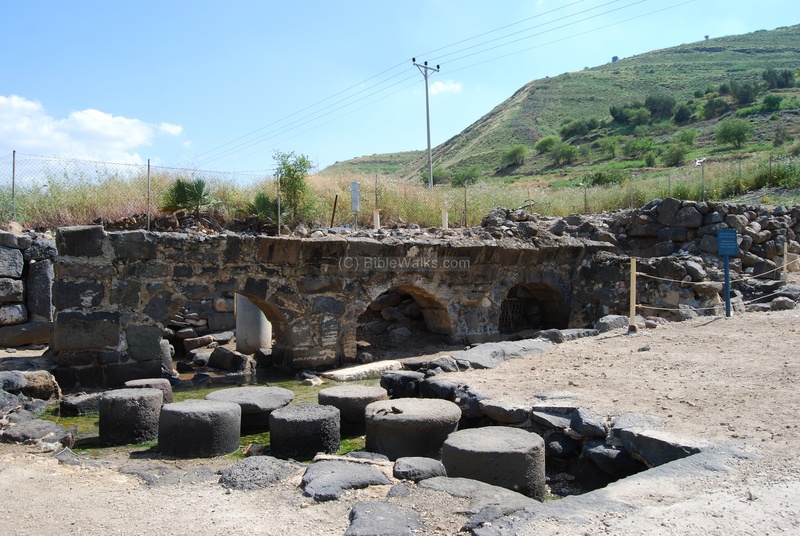 Hammat Tiberias is the place, according to Josephus Flavius, where Vespesian pitched his camp in 67AD before launching the assault on Gamla. 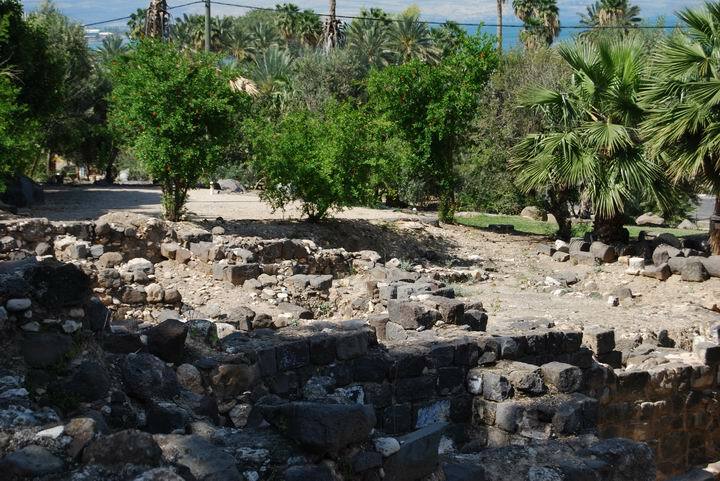 A new major city, Tiberias, was established in 18 AD several hundred meters north to the site. After several hundred years, during the Byzantine period, the new city became so large that it incorporated the older city of Hammat. The Byzantine emperor Caesar Justinius (527-567) erected new walls and the city's southern gate was constructed on the south side of Hammat. 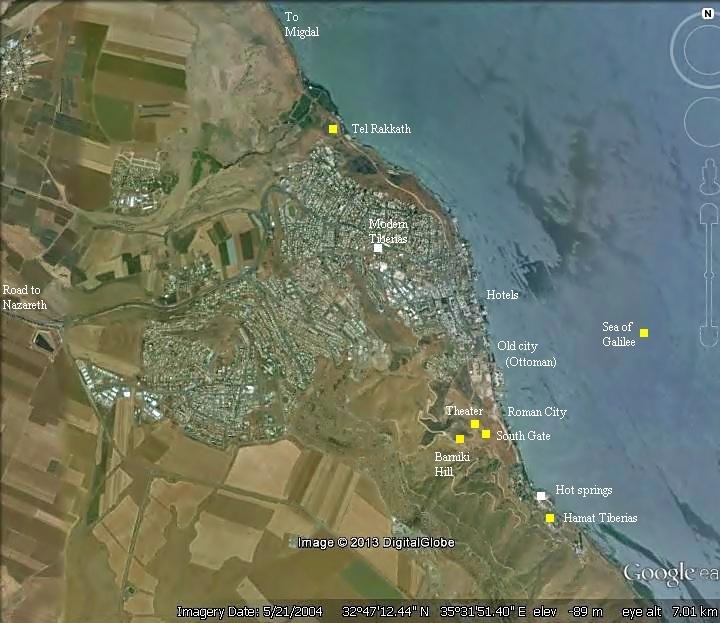 Tiberias became an important Jewish city, and several synagogues were built in Hammat. 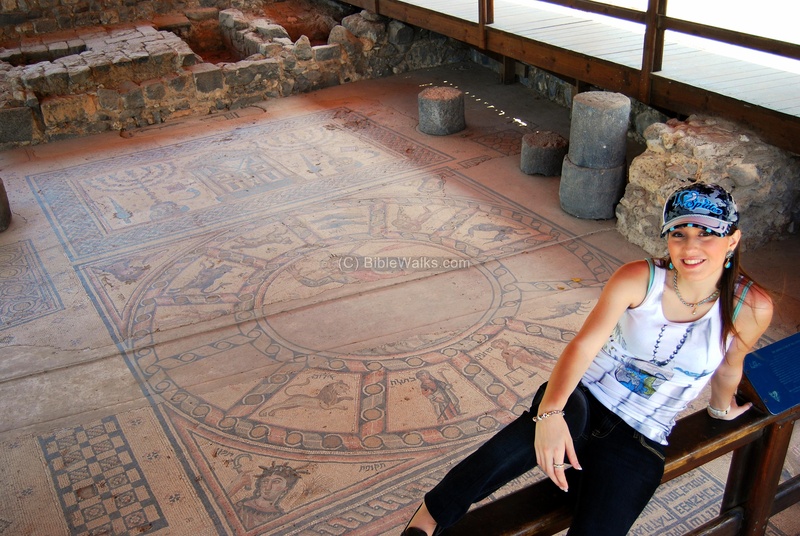 The oldest, in the 1st C AD, may have been a public house, with a court yard and several rooms. 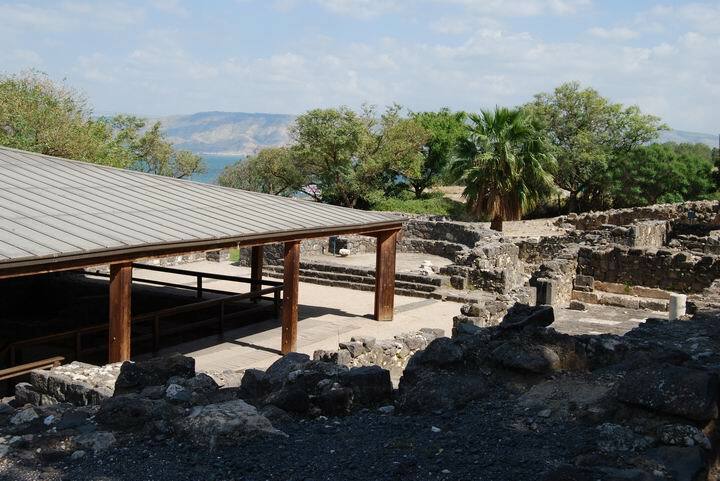 It was destroyed in the 2nd C, and replaced by a second synagogue at the 3rd C, which lasted until the 4th C and may have been destroyed in the 363 earthquake that damaged many Galilean sites. A third synagogue, the grandest of all, was built by Severus with an amazing Zodiac mosaic floor, but was destroyed in the 5th C. The 4th synagogue was built over its ruins in the 6th C and lasted until the 7th C. The 5th structure was built during the Arab conquest and was destroyed in the 8th C.
The site was in ruins since the 8th C.
During the 18th C a new Turkish bath was constructed at the site, and existed from 1780 until 1944. The site was discovered while building a new road in 1920. A preliminary excavation (1920-21) was followed by extensive excavations (1961-3). The site is a national park and open to the public. There are still active excavations and reconstructions. 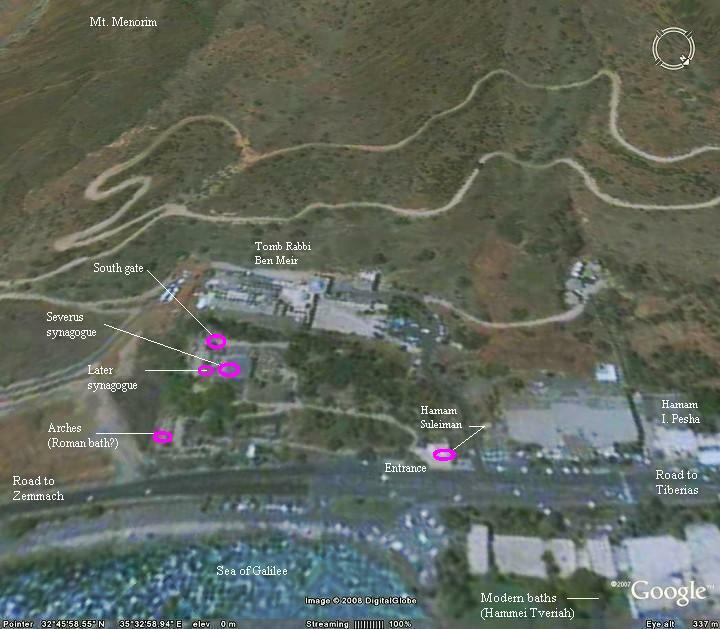 The photo below shows the entrance to the site, which is located south to the modern city of Tiberias. All around the site are excavated structures of the Roman city of Hammat. These are remnants of streets, shops, public buildings, water reservoirs and houses. They date from the 2nd C AD to the 8th C. The excavations still continue in some parts of the site. 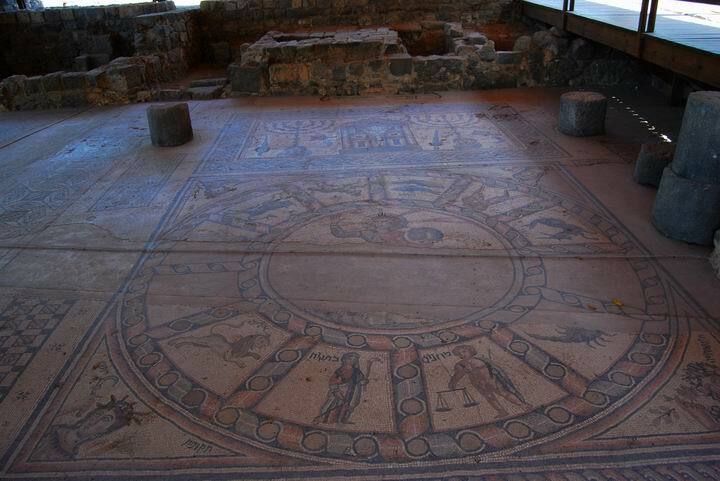 The roof below covers the most exciting finding - the zodiac mosaic, which was part of the old synagogue (5th C AD). Behind it is a section of a synagogue from a later period (6th-8th C AD). In the far background is the sea of Galilee. 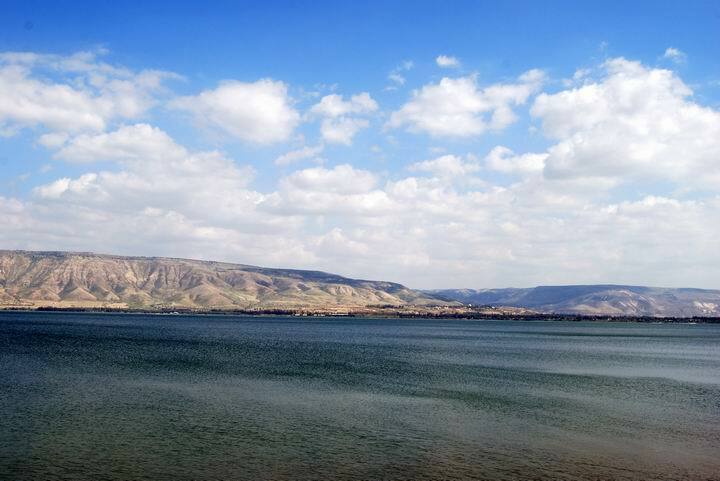 The Sea of Galilee is seen below, as viewed from the eastern side of the site. Behind the lake is the mountain ridge of the Golan heights. On the southern side of Hammat are the remains of arches, which were the foundation of a structure. This may have been an ancient Roman spa. At this area there are currently (2008) active excavations. The roof in the photo below covers one of the most important archaeological findings in the Jewish history. This was a grand synagogue, dated to the Byzantine period (5th C), and named after its builder (Severus), who is mentioned in an inscription in one of its rooms. 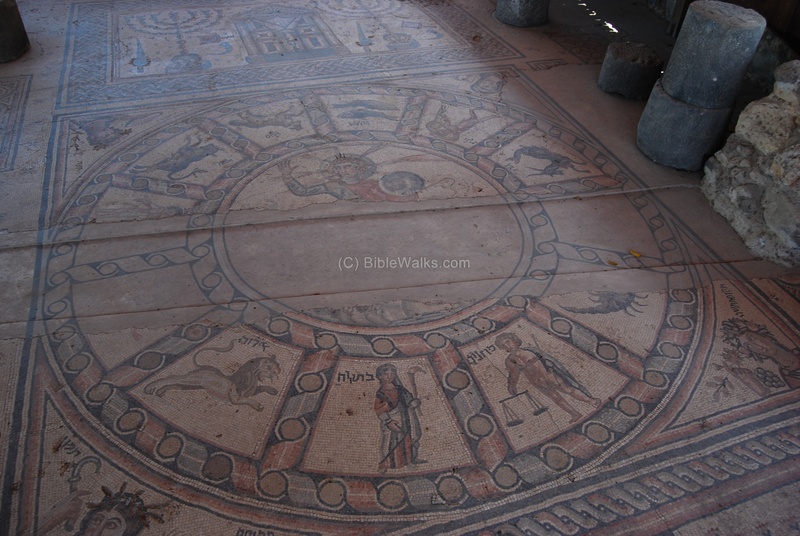 On its floor is a well preserved colorful mosaic floor, illustrating a Zodiac, inscriptions, and symbols. The Synagogue was divided into four - a central nave, flanked by aisles, and an additional aisle on the east side. 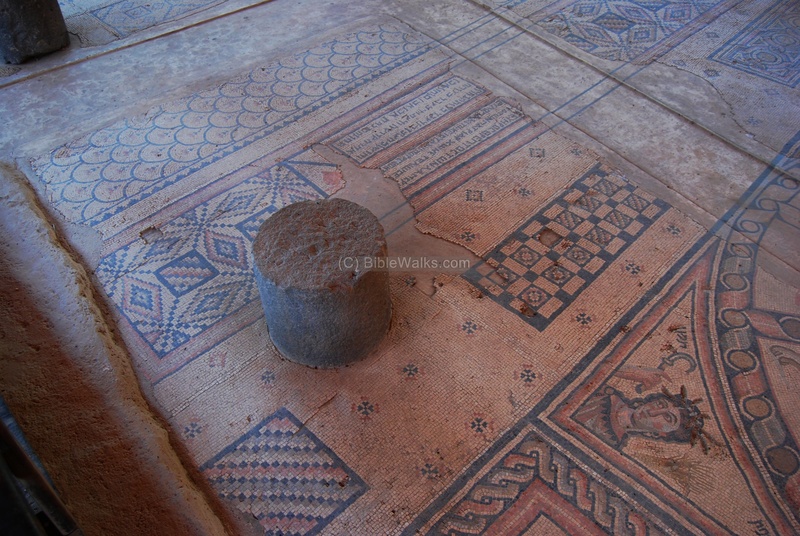 The photo below shows the view of the mosaic floor. In is composed of three panels - two are seen below. A detail of the third panel - the Ark of the Covenant flanked by two ceremonial 7-branched menorahs. There are also other cultic objects: the four species from the feast of Tabernacles/Sukkoth , pair of horns and incense shovels. The middle panel is the Zodiac, with 9 of the 12 Zodiac signs intact. Each sign has an Hebrew inscription, such as seen below (from left to right): Arie (Leo=Lion), Betula (Virgo=virgin) and Moznaim (Libra=scales). Some of the words seem to be written with mistakes. In the center of the large Zodiac is the god of Sun, Helios, riding a celestial chariot and accompanied by sun, moon and stars. The mosaic was damaged at this section, and only the upper side of the scene was reconstructed, with Helios holding the celestial sphere and whip. Helios was the Titan god of the sun who presided over the the measurement and divisions of the day, the year and the seasons. It was a common Hellenistic motif in ancient synagogues in Israel, where 7 sites (Beit Alpha, Hammat-Tiberias, Yafia, Khirbet Susiya, Beth Shean, Naaran and Husifa) illustrated the twelve zodiac signs with Helios in a sun chariot, most of them surrounded by angels. You can also check the link below. The first panel has a pair of lions flanking 9 Greek inscriptions, some of them rotated..
On the sides of the zodiac are some Aramaic inscriptions, and geometric patterns. Rotem is seen below enjoying the amazing scene. 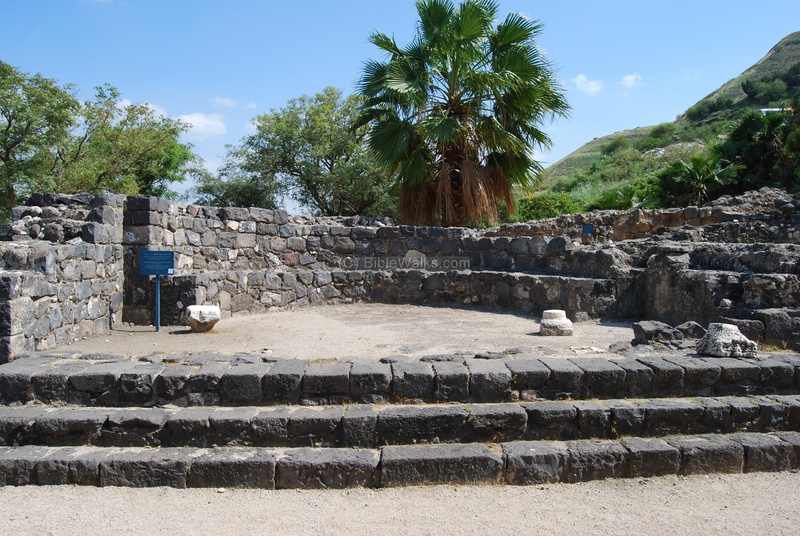 A later Synagogue (number 4), from the 6th-8th C AD, was reconstructed on the south side, on top of the ruins of the earlier structures. The photo below shows the semicircular apse - where the ark was placed - with a view towards the south. On the left side is a door that led to the second floor. On the right door is the room where the synagogue chest was found. Beneath the two synagogues, a large public building was excavated, dating to the 1st C AD. 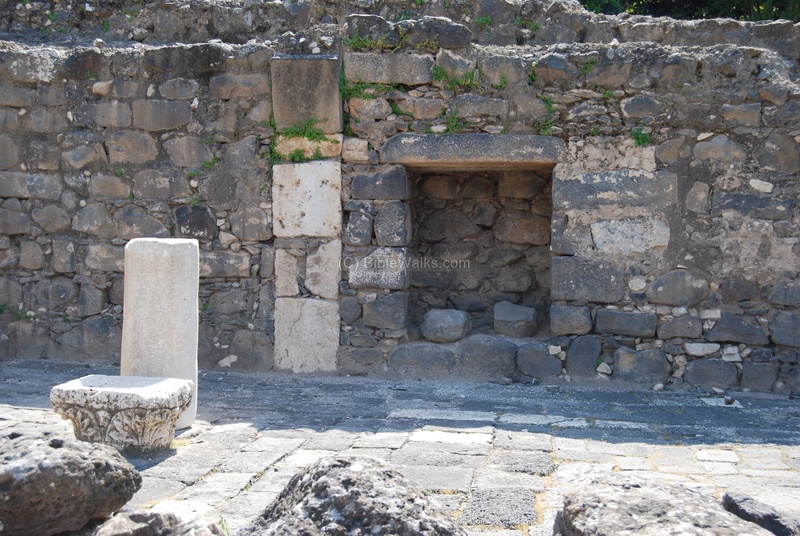 Three doors, seen below on the western side of the synagogue, led to a courtyard. The courtyard of the later synagogue is seen below, with a view towards the south. What remained from the courtyard is a white column and the base of an arch, located on the south side. 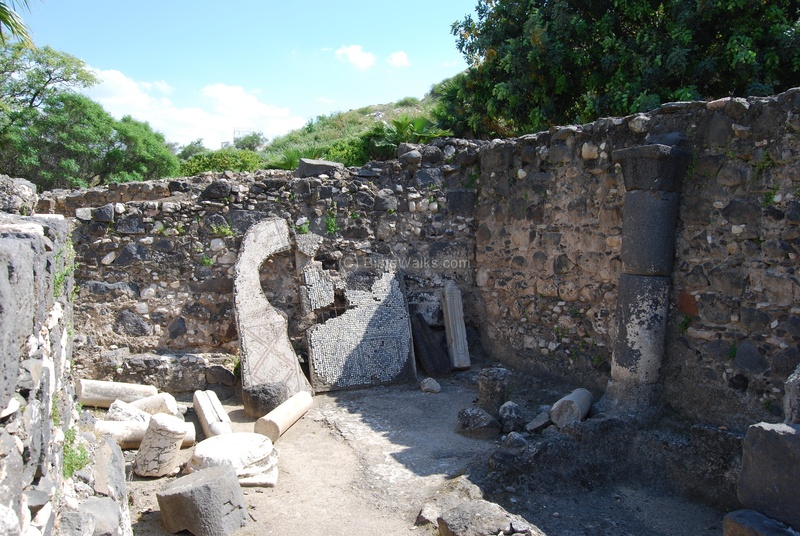 This was probably a roofed room which served as a study (Beit-Midrash). Another room with sections of mosaics and columns, located on the west side. 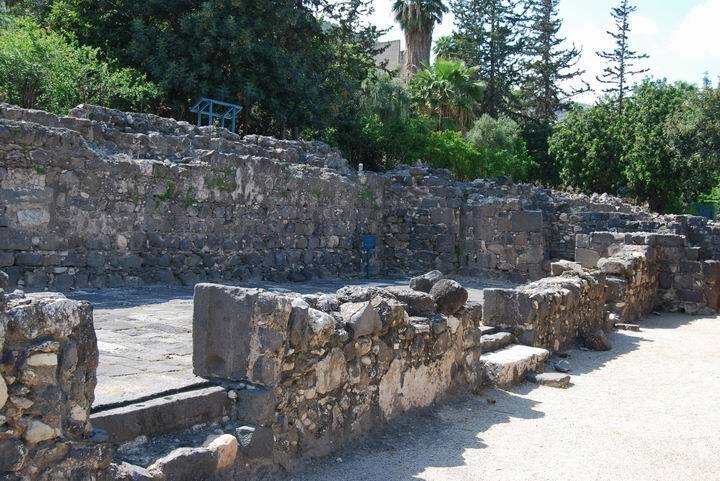 During the Byzantine period (5th-8th C) the city of Tiberias expanded and included Hammat on its south side. It was part of a very large city (235 acres). The photo below shows the south gate and walls. The walls were erected by the Byzantine emperor Caesar Justinius (527-567). Another view of the south gate. There are two towers on both sides of the gate. 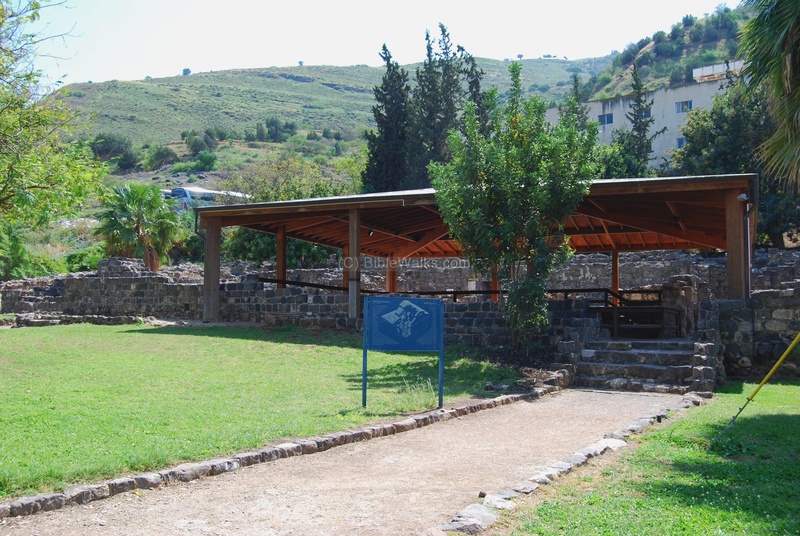 Adjacent to the entrance to Hammat Tiberias is a newly reconstructed museum called Hamam (Hammam) Suleiman, which is dedicated to the Turkish baths in Israel. 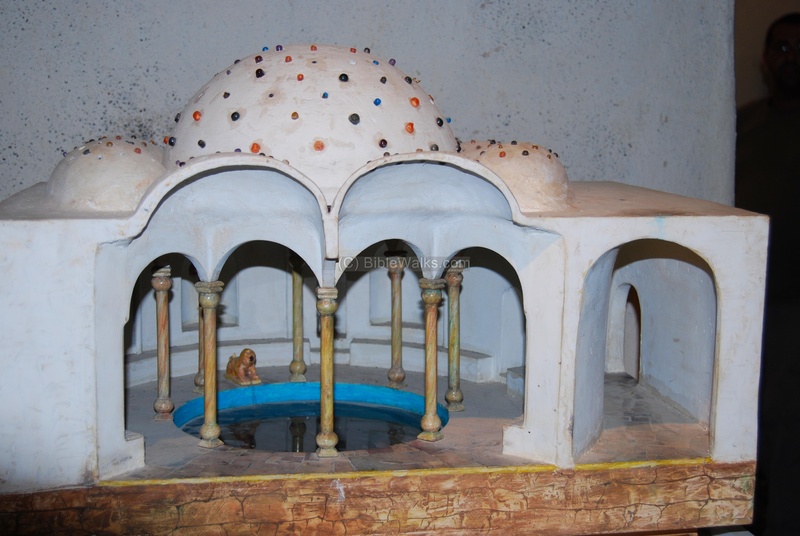 This structure was a Turkish bath that operated in the Ottoman and British-Mandate periods (1780-1944). This model shows a typical Turkish bath, which was common in all major cities in the Ottoman empire. The pool of this Hamam was reconstructed and seen in the photo below. One of the rear rooms in the baths is seen in the photo below. A display of pillows and garments used by the bathers. 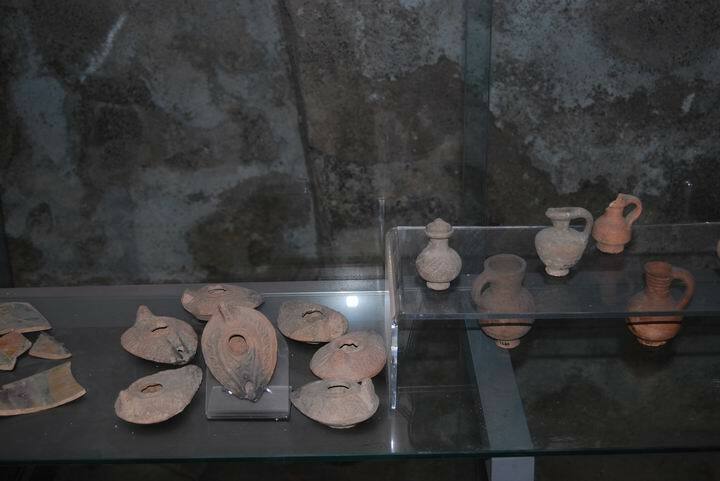 A display of oil lamps and vessels used in the baths. The plate below shows a painting of a typical Turkish bath in the 19th C.
"The sixth lot came out for the children of Naphtali, even for the children of Naphtali according to their families. And their border was ... And the fortified cities were Ziddim-zer, and Hammath, and Rakkath, and Chinnereth; and Adamah, ..."
"And out of the tribe of Naphtali, Kedesh in Galilee with her suburbs, to be a city of refuge for the slayer; and Hammothdor with her suburbs, and Kartan with her suburbs; three cities". Josephus, in his classic writings almost 2000 years ago, describes the military campaign of Vespesian and his son Titus during the campaign of the crushing of the Jewish revolt (67AD). Vespesian pitched his camp at Emmaus, or Hammat-Tiberias. 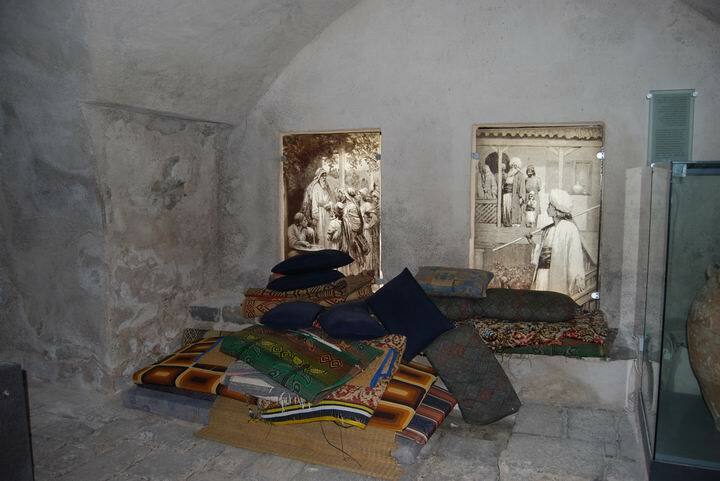 By the way, Josephus was at that time a prisoner of Vespesian and probably stayed in the site. "But Vespasian removed from Emmaus, where he had last pitched his camp before the city Tiberias, (now Emmaus, if it be interpreted, may be rendered "a warm bath," for therein is a spring of warm water, useful for healing,) and came to Gamala..."
This 13th C BC document is one of the earliest documents to describe the Canaanite cities of Israel, and also lists Hammat as one of the places the author visited. See a translation: Anastasi Papyrus. Hammat/Hammath - the name of the city, based on its hot springs. Emmaus - the name of the city in Greek, based on the Hebrew name. Another Emmaus "of Judah" is referred in the New testament - the post-resurrection of Jesus. Hamam (Hammam) - Turkish bath, based on the same root word "Ham"
Webmaster Rotem on the southern gate of Hammat.